Details: Born in Devon, Thomas Hudson started as a pupil of Jonathan Richardson who had become the great John Riley’s heir. Hudson married one of his daughters. He was also influenced by Jean Baptiste van Loo the “rage” of London at the time. Sir Joshua Reynolds became one of his students from 1740-1743 and went on to become perhaps the most famous portraitist of the 18th century. Hudson gradually recognised Reynold’s popularity and the latter’s Presidency of the Royal Academy finally eclipsed Hudson who effectively became the forgotten artist. It is ironic that at his prime his work bore favourable comparison with Reynolds’. But the story has a happy ending. When his first wife died Hudson married a wealthy widow, Mrs Fiennes, and no longer needed to compete in the market place. He died, by then a wealthy man, at Twickenham in 1779. 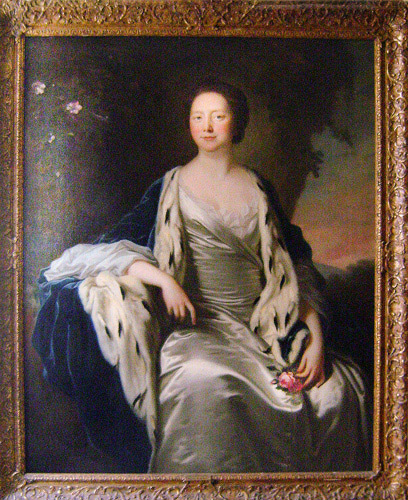 This imposing and lovely portrait is of Lady Anne Denison, wife of Sir Thomas Denison, a judge of the King’s Bench. It was painted circa 1760 and was fully attributed to Hudson in the Sotheby sale which featured the M£10 Reynolds’ portrait of Omai. About the same time Hudson painted Lady Denison’s niece, Miss Denison, who later married Jonathan Midgley of Beverley, Yorkshire. Her daughter Maria married William Beverley of Beverley and her other daughter Anna Margaretta married William, 2nd Baron Grantley. A photo of this portrait is in box 1205 of the Witt Library. Interestingly, both ladies are holding a rose posy in their left hands. Their dresses are similar, of that wonderful satin, which looks so good in portraits of the time. Hudson’s work is often confused with Alan Ramsay’s. Hudson and Ramsay were, before Reynolds, the most popular portraitists in London. Both employed Joseph and Alexander Van Aken, the greatest drapery painters, to paint their draperies and this mainly caused the confusion. Indeed, this portrait was itself once attributed to Ramsay and was offered at Sotheby’s in 1988 as such with an estimate of £10000-£15000. A photo of it taken from the sale catalogue is in the Witt Library under “Ramsay”. Hudson was a top flight artist, long since eclipsed by Reynolds, but whose reputation deserves to be returned to the eminence which he once commanded, as this lovely portrait, painted at the height of his career, amply demonstrates. It is within an good early frame, probably not the original and is in excellent condition. Please note the following: Chantry Fine Art are happy to supply buyers with a photographic image of this item and believe that all of the details given are correct to the best of their knowledge. Buyers may wish to carry out their own research and again, Chantry Fine Art are more than happy to supply any information that might assist - you can contact Chantry Fine Art either by telephone or email. Digital reproduction through cameras and monitor screens may not render the true colours of the portraits. Prospective buyers may also arrange, by appointment, to view individual items. Contact details can be found using the ‘contact’ link in the navigation bar at the top and bottom of each page. We look forward to hearing from you and thank you for your interest in Chantry Fine Art.